Chibitronics conductive fabric tape patches. Get 64 swatches of conductive fabric tape, pre-cut to 0.2″x0.6″ (5mmx15mm) patches for your projects. 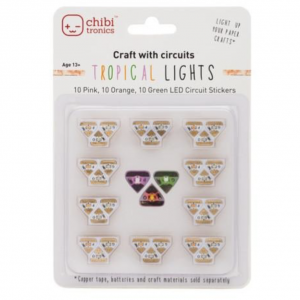 Whether you are just learning or a seasoned crafter, Chibitronics conductive fabric tape patches are a must-have accessory. 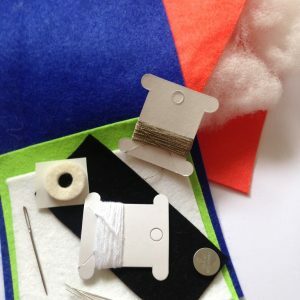 It’s a tiny bridge of durable conductive fabric with a highly conductive adhesive on one side. 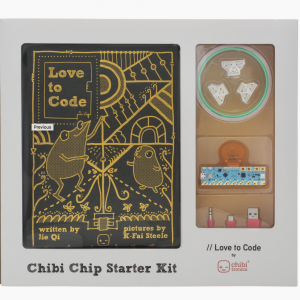 Use it to patch gaps in copper tape, make T-junctions, build live hinges, or connect to our Love to Code products in a semi-permanent fashion. You can even find new life for old, used-up stickers by bridging between the shiny pads on the top side of our stickers and adjacent strips of copper tape. 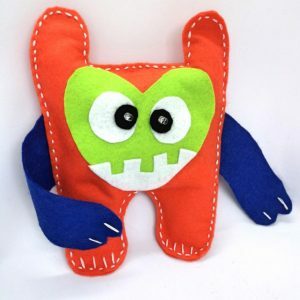 …or create a three-way “T” junction! 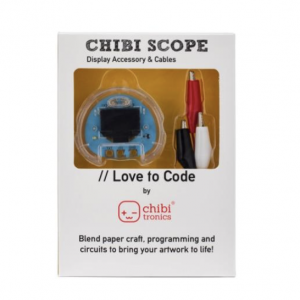 After you’ve finished testing your Chibi Chip with a craft project using the Chibi Clip, you can use fabric tape to create a flat, semi-permanent bond between the Chibi Chip and your circuit! 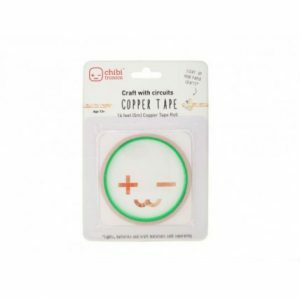 Made out of a special nickel-plated polyester-copper weave and laminated with a conductive nickel-acrylic adhesive, our conductive fabric tape patches can make robust electrical connections that can survive creasing and hinging. As always, ensure that the metal surfaces you’re planning to sticker over are smooth and clean of oil and dirt, and that your fingers are likewise clean and dry. Dirt and oil resist electricity, so even an invisible film of dirt will degrade the reliability of any electronic sticker. Best practice is to always wash and dry your hands before applying stickers, and to use a hard pencil eraser to rub off any dirt or oil that might have built up on your copper tape before applying the fabric tape patches.